If you look at cost it is not much changed from 2009 for most of the things except rent which is increasing in few areas. As I have mentioned in my earlier post too, rent is something you can control too by staying away from city center. As commute in Singapore is very well managed, you reach office pretty fast with combination of MRT and Bus in peak hours. 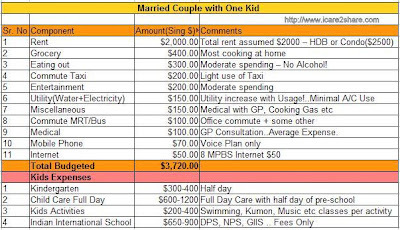 Kids Expenses : Kids are expenses are something one need to calculate with some flexible budget as most of the activities you are not aware that you will start or not. It also depends how old your kid is when you first arrive in Singapore. As the time goes, kids expenses does go up in any country. In Singapore you have lots of activities for kids which are all year round, like Swimming, Skating etc ..Which normally in India are restricted to warm seasons!. So make sure that you make a good estimate of kids expenses before decide to jump on a plane to Singapore!. Indian International Schools in Singapore: This is very important decision for Indian Kids. I get lot of emails of readers asking for information on fees and why Indian International School etc. About fees, I have already provided that information, but you need to verify from School websites as these things do change yearly. If you plan to stay in Singapore for short term(3-5 years) I would recommend to go for Indian International School for your child. Although it is expensive as compared to Singapore Local Schools, it makes life much easier for the kid when he/she returns back to India. All the the Indian International Schools in Singapore are affiliated to CBSE. Based on your location you can decide the school. In my personal opinion NPS is a good school which is started recently there. DPS and GIIS are also well managed schools.One good thing about these schools is that generally you get admissions easily whenever you need and fees are published on websites. There are no donations, just refundable deposits. I hope this helps you. Please do email me if you need any more specific information. Hello, I would be moving to Singapore very shortly, in a period of few days. I have few questions and would be glad if you could answer them.Could you please let me know any web sites where I can search for apartments for rent? Also SGD $2000 for accommodation sounds really high! Is it impossible to get a 1-bedroom apt at say SG$ 1000? Sandeep, your blog was very informative. We are an Indian family of 4 (2 adults & 2 kids) who plan on migrating to Singapore. One kid goes to primary school and we have no issues about sending kid to local primary school which teach Hindi as Mother language. I came across quite a few schools in the net. What is the average monthly fees for these schools? It was a boon to have come across your blog! WE are a newly married couple basicly from Pune but myself lived in USA for 4 years and my husband in Europe for few years before our marraige and now planning to shift base to Singapore. Even though we have some experience in living abroad , it is a different ball game for different places. I am sure you hear a lot of this but I must say it, you have made it pretty clear for us first timers to hunt or plan for moving to SGP and made life easier for us to take decisions accordingly. Wonderful, Sandeep. You've shared a lot of very useful information - it was like talking to an old friend. Looking to come to singapore soon and came across your blog. Very informative. Super blog.. but some expenses must have increased by now.. we can always take this as benchmark and then go ahead with adding delta. Much appreciated. for some reason I dont see any time stamps on the comments, so not sure the prices are ref to which month/year. But I am looking for a 2BR Condo (sept 2011) for shifting into in the East coast area_ I was told many Indians live in that area... but cant seem to find anything below 3000$. HDB also is not less than 2500. Have the rates of everything else also gone up similarly? yes prices in East Coast were always higher and now more recently. You are right about the prices for Condo and HDB. They are ridiculously high and it is all about demand and supply in that area. It is so convenient to live in East Coast due to the fact that you are very near to the CBD where the most action in Singapore is !! Am being offered a salary of SGD 10000 per month without medical benefits. Have a newborn and wife who will be moving with me. You think 10k per month is a good number if we want to rent a 2 room apartment in a condo? Would be great if you can comment given that most of the data shared by you is for 2010. 10k SGD is a good salary!. You should surely be able to afford SGD 3000 condo in many areas in Singapore. About medical, you can always buy an medical insurance once there which is required for hospitalization. For usual medical expenses I guess they are not much ..I have a post about Medical expenses too ..you could search my blog. 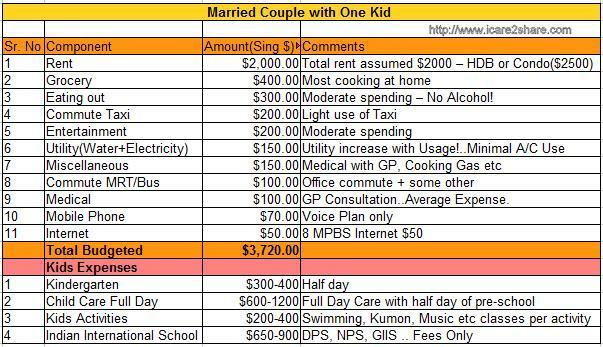 I am planning to get married to a guy in singapore who earns S$2k/ month,he stays in woodlands. All else are good, his salary is the only hindrance for me to decide, i expect a moderate living, i have plans to work too. But then would like to know if we can manage only with his salary. I dont wanna lead a crunchy life. Would appreciate any reply, thanks. SGD 2k/pm Salary is low for 2 people to live comfortable life. If you plan to work, it is better that you find a job while you are in your home country then move to Singapore. This is my personal opinion and cannot be taken as decision. Again what I say comfortable and what's somebody else's definition could be different.